A Nova Scotia woman is tired of being declared dead. Syrup suckers. First they beat the USA in hockey and the next thing ya know (eh? ), they think they're immortal! Reminds me of the game various deejays used to play on the radio, asking about various celbrities: What is it with them, are they dead or Canadian? put an 'e" up there- "celebrities"
Wait - the second time, they sent her a letter to inform her she was dead. And in that letter, to a dead person, they asked for a refund of money they paid her. Just exactly how did someone think that was going to work? If it were me, I would have replied to the letter "Thank you for informing me that I am dead. Unfortuately as I am now deceased, I will be unable to repay the money as you have requested". Happens to me every time I try to take a nap. Obviously the reason for the confusion is that she lives in the Garden of Eden. being declared dead in canada - ok - is that an oxymoron? The only things in life that are certain are death and taxes. Thank goodness this is in a nice country like Canada. Other countries may just dispatch someone to her home to "clear things up",iykwim, so they wouldn't have to go in and change the paperwork. How come I gotta deal with the bot and the spammers still get through? 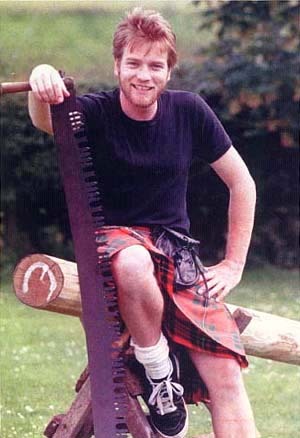 wdog, somebody needs to splain you the proper men in kilts thing. The s.b. has been notified. The Wooden Dialogue Generator is no longer blurking. I hate it when I die more than a couple of times. "No, you're not, you'll be stone dead in a minute!" wiredog that's a man in a skirt. This is a man in a kilt. There is a huge difference. One of my old girlfriends reported once that people all day were telling her how sorry they were but no one stayed long enough to tell her why. Finally, she found out that I was dead, a gross exaggeration. My gosh, all that happened was that I was driving a VW bug with no seat belts at 50 mph when I hit a Chevy head on, got thrown out of the spinning car, slid 35 feet on my face and stomach (which removed all the clothing from the front of my body) and wound up unconscious in a pool of gas by the side of the road. Somebody checked my pulse and couldn't find one, so they called the funeral home and covered me with a sheet. Boy were they embarrassed when I woke up. Dead? Not hardly. Glad you're still among the quick, Steve. You know that point in every work day when you decide, "That's it. I'm done." In Spain, General Franco has been fighting the same kind of treatment for years. Steve, if you had awakened in the ER where I was working, when you came to enough, I would have told you how lucky you were to be among the living. Then of course since all the clothing was off the front of your body I would have had to check to see if you had a nasty road rash. Strictly professional you understand. What's with all the weird (and I don't mean that in a good way either) folk posting gibberish here all of a sudden? And now I forgot my comment too! Hey, Bonmot, I know that feeling. I'm retired now and the worst part is you never get a day off. Cindy, yes, I had several nasty road rashes including one small, very personal one. They were small and scattered. I believe I was bouncing as I slid along. I also had fewer teeth than I started with, a broken nose, a broken knee, and chemical burns from the gasoline pool I was in. I still remember the teenage girl that stood next to my "body" under the sheet. At the hospital she told me, "I'm sure glad it was raining!. 'Cause when you spoke up under that sheet, I peed all over myself!" Welcome to the club; I woke up under a sheet. I went to the hospital in the back of the funeral home wagon. I don't guess they made that many deliveries. Sounds like a miracle to me. One of the scariest things that happened to me was getting hit by a car when I was riding my bike. But I just got scrapes and bruises. Fortunately I was wearing a helmet (which I pretty much always did). You're all just jealous because we beat you in hockey. TWICE! Steve the scariest accident I ever had was when I flipped my Honda Civic. It was one of the earlier models and only weighed about 100 lbs. The doors went 'plink' when you closed them. I was on my way to pick my husband up at work about 11 pm. I had a puppy that got under the gas pedal and I guess when I bent down to get him out of the way I started spinning and then the car flipped completely over landing on it's tires. I felt like I was watching a movie in slow motion when it happened. The car was still running so I went on and picked up the husband. Of course I had a large crying/screaming fit when he got in the car asking me why there was a large dent on the roof. btw, I was 8 months pregnant at the time. My son still hates to ride with me driving. Wait...so is Canadian health care good or not? Wow, Cindy, you are lucky, too. Not many people flip a car and drive it home from the wreck. Just think if we could bottle that time-in-slow-motion thing. Also, there is nothing that will make you a believer in seat belts faster than experiencing an accident. After you flipped, did you happen to get out and yell, "Ta-Daa!" before you went on? That would be so cool. Yeah, Cindy, that was an amazing thing to experience. Glad you didn't get hurt.